Uherské Hradiště ( https://www.mesto-uh.cz/ ) is a town in the Zlin Region of the Czech Republic, located 23 km southwest of Zlin on the Morava River. It is the capital of the Uherske Hradište District. The town itself has a population over 25,000. The agglomeration with the two neighbouring towns of Stare Mesto and Kunovice has over 38,000 inhabitants. The town was founded in 1257 by the Czech king Premysl Otakar II. 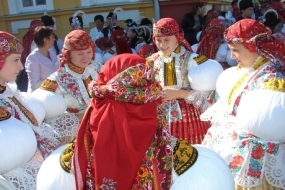 The town Uherske Hradiste is the center of Moravian Slovakia, a region known for its characteristic folklore, music, costumes, traditions and production of wine. The historical city center is preserved memorability.